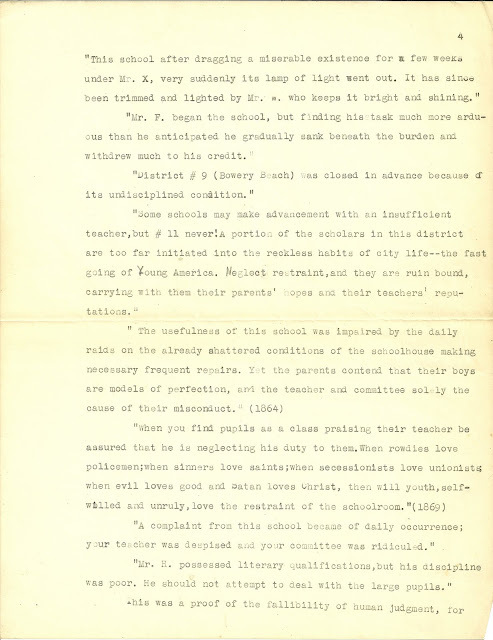 This is a six page, double spaced mimeographed copy of a report that Edith B. Murray wrote about the history of education in Cape Elizabeth, Maine. I'm reluctant to transcribe it here because I'm not familiar enough with copyright laws, and I don't know the year the paper was written. However, page 4, shown above, consists of quotes found in Cape Elizabeth municipal records, so I'm taking a chance on it. Of the rest, I'll summarize. Expect to be amused at some of the quotes. This could have been prepared for a talk at the historical society or for a publication. It's also possible that she prepared it for a class on her teacher recertification. She was a teacher before her marriage; perhaps she took it up again when her children were grown. If she did become a teacher again, it was probably after 1930, as the Census for that year did not include an occupation for her. She starts with Robert Bayley, "late from England", apparently the first teacher at the Cape, who was glad that he had enough books so that no more than 6 boys had to share. The school had been set up because at that point in time Falmouth, of which Cape Elizabeth was a part, had surpassed the "fifty family" law of Massachusetts, wherein once a town had fifty or more families, a school had to be established or the town would face a fine. Mr. Bayley alternated between sites at The Neck, Back Cove, Purpooduck and Spurwink. Mrs. Murray referenced a phrase in an old diary that "Seth and Josiah were in grievous pains because of Master Bayley's teachings". In 1765, Cape Elizabeth petitioned to be set off from Falmouth, and in 1766 the new town voted "that we raise 50 pounds for a Gramer scool; that Loring Cushing be chose scool master; that the scool be moved in those different parts of the district as the selectmen think proper". During the Revolution, when monies had to be raised for the Cape's quotas of fighters, expenses for the school were pared to the bone. "That Long Creek shall have twenty pounds to support a school this year, and shall keep such a school as to Save the Town from a Fine. The Town is to be in three Partes (Long Creek, Purpooduck and Spurwink) and one of the other Partes is to have it the next year and have the same sum and then the other part is to have it till every part has had its turn". This system continued until the war's end. "Voted to raise 1000 pounds for the support of schools"
"Voted that Town Treasurer Fickett be instructed as to what he shall do [with?] all the Continental Currency in his office." "Voted that we devise some method to get relief from this burden of taxation"
Post-Revolution, new school districts were created; by 1857, there were such school districts in Cape Elizabeth, each one apparently autonomous and with an unpaid agent who arranged for two sessions: a summer session to be taught by a woman at a wage, in 1851 of $1.82, and a winter term taught by a man at a slightly higher rate of pay, who could handle the "big boys" who were able to attend in the slack time of farming. Miss T. labored under difficulties in having an average of 58 scholars crowded in so small a space. Later the small pupils were excluded and better results were attained." "Miss Julia Boultenhouse has eighty children in the Primary department; she has remarkable ways of interesting them while she trains their infant minds to study (1864). "This school after dragging a miserable existence for a few weeks under Mr. X, very suddenly its lamp of light went out. It has since been trimmed and lighted by Mr. W., who keeps it bright and shining." "Mr. F. began the school, but finding his task much more arduous than he anticipated he gradually sank beneath the burden and withdrew much to his credit." "District #9 (Bowery Beach) was closed in advance because of its undisciplined condition." "Some schools may make advancement with an insufficient teacher, but #11 never! A portion of the scholars in this district are too far initiated into the reckless habits of city life - the fast going of Young America. Neglect restraint, and they are ruin bound, carrying with them their parents' hopes and their teachers' reputations." 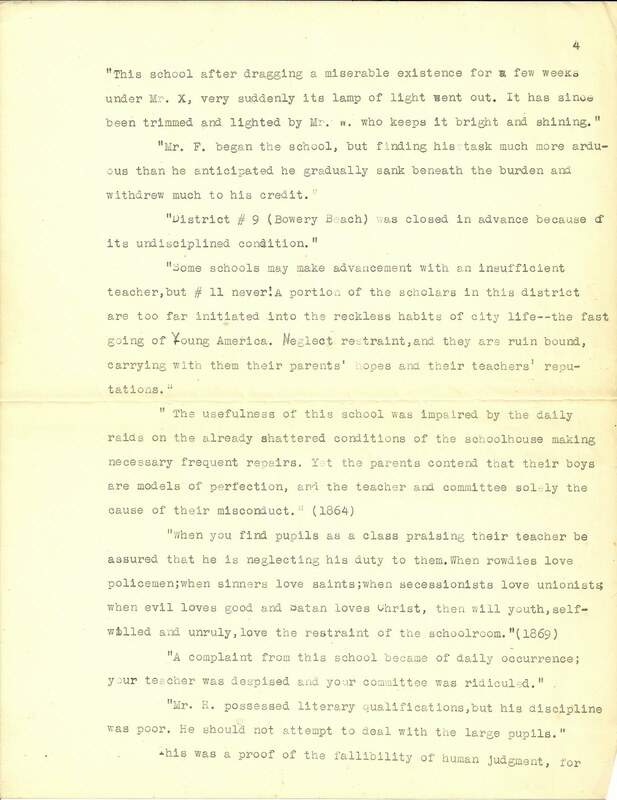 A complaint from this school became of daily occurrence; your teacher was despised and your committee was ridiculed." "Mr. H. possessed literary qualifications, but his discipline was poor. He should not attempt to deal with the large pupils." This was a proof of the fallibility of human judgment, for this man went on to have a highly respected career in education. "More than half the children are out of school owing to berry picking. Those who come are usually tardy, and there is more or less absence toward night." "Good, all but the plan"
"The best in town, but could be improved." I'm guessing that Mrs. Murray's circumspect wording in one paragraph was designed to imply that the school house in School District #9 at the south end of town, was finally awarded, in the 1880s, an appended "commodious" outhouse. Apparently by 1857 the town was having a hard time finding an unpaid agent for a position that was requiring more and more time. "We suggest that a supervisor be employed to occupy a large part of his time to perform these duties. We advise a remuneration that would be a source of some profit, but which would not be a goal for the unscrupulous office seeker". The author closed her report with a reference to the "faded and faintly legible handwriting" of the records of town meetings she perused during her research. Olive Edith (Bradbury) Murray was born on 26 June 1885 in Massachusetts, the daughter of Willard J. Bradbury, born in Maine, and his wife Josephine (Wormell) Bradbury, who was born in Massachusetts. Olive Edith's paternal grandparents were Ivory and Olive Ann (Libby) Bradbury of Hollis, Maine. I've been less successful finding out information on her maternal grandparents. The best I can figure is that Josephine's mother was Nancy, born in New Brunswick, Canada, and the matron at a Boston children's home, where Josephine herself also worked for a while. Olive Edith Bradbury married Fred Prescott Murray, who was born 22 August 1874 in Maine, the son of William [Peabbles?] Dyer Murray and his wife Elizabeth Frances (Dyer) Murray, both born in Cape Elizabeth, Maine. Fred's paternal grandparents were Luke Libby Murray and wife Phoebe Sawyer (Dyer) Libby. His maternal grandparents were Rufus and Elizabeth (Jordan) Dyer. I'll be writing a companion post on the genealogy of teacher Julia Boultenhouse, the "remarkable" teacher referenced in the bulleted quotes above. If you have corrections, additions or insights regarding the information presented above, please scroll down to the comments box or contact me directly. The Cape Elizabeth Lions are trying to pin down the date of construction of their clubhouse at 1 Wheeler Rd. It was deeded to the school District #9 in 1954 but a note in William Jordan's History of Cape Elizabeth says it was constructed in 1949. We are applying for entry on the National Registry of Historic Places and would like this information for that purpose. Would the document have any insight for us? You'll find my email address in the right margin near the top under Inquiries. Send me an email and I'll send you images of the entire 6 page report; however, the report deals with 18th and 19th century Cape Elizabeth. Good luck with your quest!